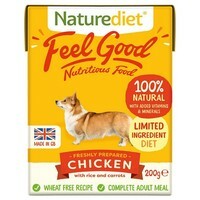 Naturediet Feel Good Chicken is a complete and nutritionally balanced meal made using freshly prepared British Chicken, Carrots and Rice. Gently digested and highly palatable, this tasty single protein Chicken meal is 100% natural and contains all of the essential nutrients your dog needs for a healthy diet. Appropriate for dogs requiring a low purine diet and those suffering from sensitive digestion and allergies.